Nick Saban and the Crimson Tide will be opening the 2015 season with a tough neutral site matchup. Alabama begins its push for another berth in the College Football Playoff on Saturday night against Wisconsin in a neutral-site game at Cowboys Stadium in Arlington (8 PM ET, ABC). The question those of us who handicap teams in Las Vegas have to ask ourselves is this—will the Tide offer better value than last season, when they were a money-burner? To the average fan, it was business as usual in ‘Bama, as Nick Saban’s team went 11-1 in the regular season and then won the SEC Championship Game before ending up in the way of Urban Meyer’s freight train out of Columbus on New Year’s Night in New Orleans in the Playoff semi-final. But for those who wagered on the Tide, it was a different story—5-7-1 against the Vegas number. That 5-7-1 ATS record (with one game against Western Carolina off the board) was actually better than it appeared. Tide backers got a big break in the road game at LSU. Alabama was a (-6.5) point favorite and only covered because the game went to overtime in a 20-13 final. Another cover, as (-10) favorite against Auburn came by a single point, 55-44. None of the ATS losses were as close. What this boils down is that Alabama was overrated in 2014. Before Tide fans rise up in rebellion, remember that the term “overrated” is a criticism of the betting market (the collective wisdom of oddsmakers and the wagering public that ultimately creates the posted line) rather than the football team itself. When you look at those lines ‘Bama was facing—giving nearly a touchdown on the road at Baton Rouge at night, giving double digits to Auburn—you can make a pretty good argument that they simply weren’t reasonable. But that’s what happens with highly successful dynastic programs. The public wants to bet them. Las Vegas keeps pushing the number higher. Eventually it becomes unsustainable. The question here is whether this was a one-time phenomena, or if Alabama is now a prime go-against team? 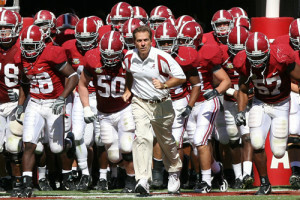 Expectations are modestly down this year, which Alabama “only” ranked third in the nation, behind Ohio State and TCU. The Crimson Tide are “only” a (-11) favorite against Wisconsin, as opposed to the (-22) they gave up to West Virginia in last year’s neutral site opener—a 33-23 non-cover win. Zultan predicts college football fortunes in Week Two. 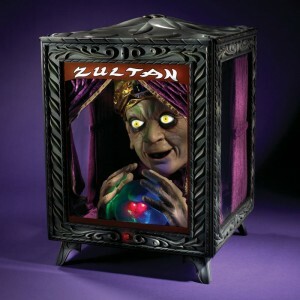 Zultan should be very humble after week one of his vaunted football predictions. The NCAA football gods, therefore, struck him down. Hordes of you outguessed Zultan who quivers in shame and humiliation with a mere 10-4 record in week one. The mighty one has learned two valuable lessons in predicting the outcome of football contests. (1) When in doubt in projected close contests, always pick the home team. For example do not pick Connecticut to overcome Michigan in Big Blue’s house or Purdue to get the best of the Irish in South Bend no matter how much the crystal ball tempts you. (2) Also always make sure that the team you select is going to be playing––Zultan did not realize that half of the North Carolina team would be sitting on the sidelines when he made his ill-fated prediction that NC would win this contest. 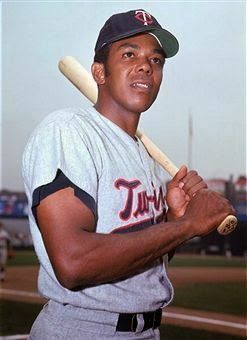 Besides that, the Gophers have always been a thorn in the side of the all-seeing one. So now you think Zultan is an easy mark. If so, try him again this week and learn your lesson as Zultan did––the hard way! Zultan senses redemption coming his way this week big time. Click here to pit your puny powers of prognostication against the mighty Zultan for a chance to win a prize. See the end of this prediction for a comprehensive list of all of you who smote the Zultan, scorched his crystal ball in week one. Do the hokey-pokey one time around the room and come back for week two! It's the best time of the year - football season in the Big 10 Conference. It is August and we have waited long enough for college football to get underway. It is time to begin announcing the winners and losers––then explaining why and how we went wrong the following week. The life of a forecaster is not an easy one. At least until the first of September we will be safe with these Big Ten Football Power Rankings. 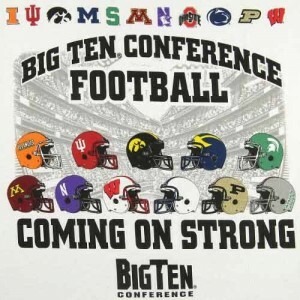 The Big Ten Conference gets some grudging respect after winning a few Bowl Games in post-season play after the 2009 season––four wins to be exact after sending seven teams to bowl games. Two BCS wins by Ohio State whacking Oregon in the Rose Bowl and Iowa knocking back the Ramblin’ Wreck from Georgia Tech in the Orange Bowl enhanced the Big 10 aura heading into 2010. This year the Big Ten enters the foray with four teams in the top 25. The exact placement depends on the particular poll you chose to believe. But it is safe to say that most expect Ohio State to be in the top five, Iowa in the top fifteen, Wisconsin in the top twenty with Penn State in the top twenty-five.